Fear of defeat drives military men to folly. 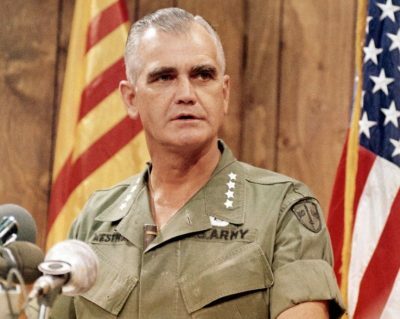 Early in 1968, General William Westmoreland, America’s commanding general in Vietnam, feared that communist forces might overrun U.S. military positions at Khe Sanh. His response, according to recently declassified cables as reported in the New York Timestoday, was to seek authorization to move nuclear weapons into Vietnam. He planned to use tactical nuclear weapons against concentrations of North Vietnamese Army (NVA) troops. President Lyndon Johnson cancelled Westmoreland’s plans and ordered that discussions about using nuclear weapons be kept secret (i.e. hidden from the American people), which for the last fifty years they have been.